Premier's newest pontoon is 31 feet long, 12 feet wide, has 900 horsepower, and goes 60 mph. Wow. A few months ago I had the opportunity to run the Premier Sunsation 270 Walk-On, a double-decker pontoon boat with twin outboard power, joystick steering and, of all things, a waterslide. 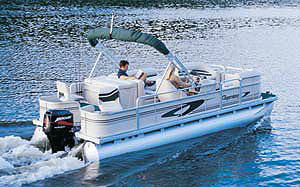 At the time I felt as if it was one of the most imaginative pontoon boats on the market. Then Premier started announcing its 2016 lineup. That’s when things got interesting. 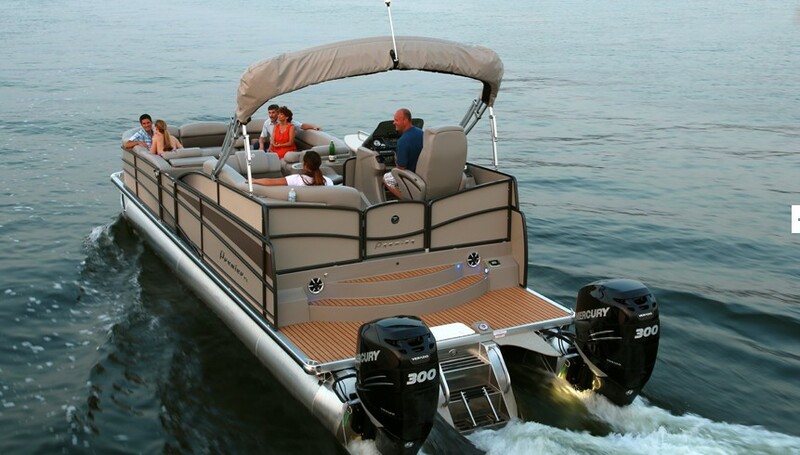 When was the last time you saw a pontoon boat with triple outboards on the stern? "Never," is the correct answer. Among Premier’s announcements was the Dodici 310, a nearly 12-foot wide, triple-tube pontoon with three (yes, three) Evinrude E-TEC G2 outboards racked on the stern. Do the math and you’re talking as much as 360 square feet of party space blasting across the water at 60 mph... definitely worth a closer look. In case you were wondering, “Dodici” is Italian for 12; it refers to this pontoon’s gaping beam, which is just two inches shy of 12 feet. 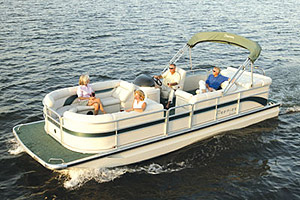 Add in its 31-foot length and triple-tube pontoon setup and you’ve got the capacity to entertain 26 people aboard. I don’t know about you, but I’m not sure if I've got 26 friends I could muster all at once for an afternoon of boating. Pictured here is the Dodici 310 with the "Pub" deck layout, which has a full bar, swiveling bar seating, a pub table, and a huge forward lounge area. To accommodate those 26 folks, Premier offers the Dodici with two interior layouts: Cruise and Pub. The Cruise package is a more traditional interior scheme chock full of comfy chaise lounges, cushy captain’s chairs, and plenty of places to lie down and relax. If your plan is to cruise around mainly with an average size group of friends, and relaxation and lounging are your aim, this seating setup is a good bet. If entertaining larger groups of folks is part of your prerogative, the Pub seating layout is one of the more unique you’ll find in a pontoon. The Pub package takes full advantage of the Dodici’s expansive and wide deck spaces. Aft is a full stand-up bar with fixed, swiveling bar stools, an overhead rack for wine and cocktail glasses, and a sink surrounded by a roomy food preparation counter. Just forward of the bar to port is a stand up table with three swiveling bar stools. All the way forward is what is best described as a lounge area, with a huge U-shaped seating area and a cocktail table that’s bordered by two swiveling captain’s chairs. It’s much like a couch and recliner affair you might find in an upscale bar. Except this bar moves at up to 60 mph, thanks to 900 ponies’ worth of two-stroke outboard power. 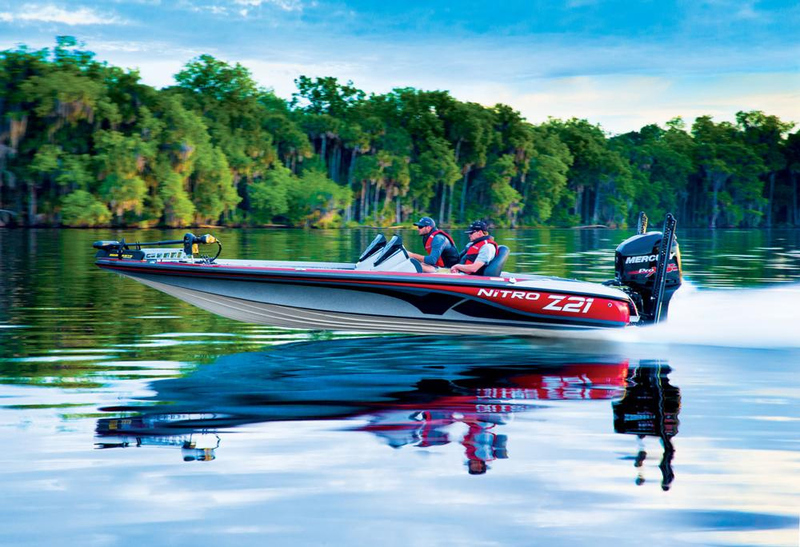 Three Evinrude E-TEC G2 300-horsepower outboards power the Dodici 310 up to 60 mph. 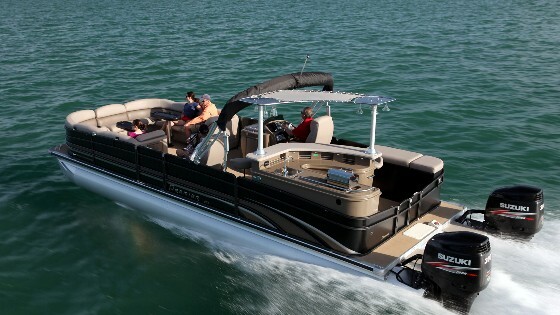 To contend with that wad of horsepower the Dodici has Premier’s 42-inch PTX performance pontoon package. It includes a massive 42-inch center tube, nosecone enhancements, tubes with angled running surfaces, wave shields, and more. The PTX tube system means you can strap more horsepower to the stern, but it also provides handling and cornering qualities similar to many traditional fiberglass boats. While that sounds like a marketing gimmick, I’ve run enough of Premier’s pontoons to confirm the system works as advertised. You’ll drive the Dodici 310 from the wide and spacious starboard side helm, located amidships just across from the stand up pub table. It’s a larger console than you’ll find on many pontoon boats, which means there’s room in there for more electronic goodies such as multi-function displays and Premier’s optional Beacon System. It’s a touch-panel display that integrates GPS, engine stats, stereo, and other functions into a single, easy-to-read unit. The Dodici 310’s helm unit and console are made of a single piece of custom-molded fiberglass that’s raised a bit to provide better visibility fore and aft. The helm and dash are nicely laid out and rich-feeling, with stitched leather trim and faux carbon-fiber accents. While Premier hasn’t released pricing for the Dodici 310 yet, we should expect this to be a pontoon that runs well into the low to mid $100,000's. That may seen like a lot, but when is the last time you saw someone’s living room jetting across the water at 60 mph with 26 people lounging about? 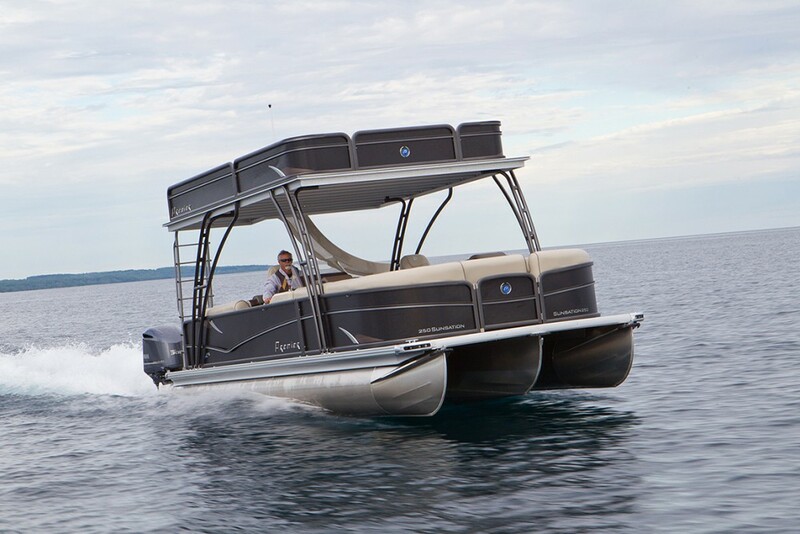 It's not something you see every day, for sure—because the Dodici 310 isn’t any ordinary pontoon boat. Other Choices: Some other "big boy" pontoons you should consider include the Bennington 30 Club Twin and the Premier Sensation 270 Walk-On. 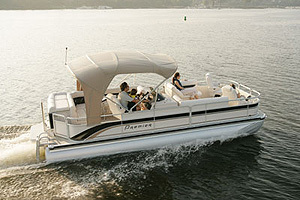 For more information, visit Premier Pontoons.